When I see this puppy, my imagination pictures a little boy that we can’t see. It is his first day of school and he is getting on the bus. The puppy doesn’t understand why he can’t go too. Usually when the little boy leaves out the gate, the puppy has on his leash and they are going to the park. The puppy wants nothing more than to be able to get on the bus with his boy. He doesn’t care if he belongs on the bus or not. His boy is on the bus, therefore he should also be on the bus. Have you ever felt like that? Like stop the world and let me get off? When you are so unhappy that you can’t function any longer. For me getting lost in a good book was a great escape. I loved it because it was usually a mystery of some sort and I was busy figuring out “who done it”. Or it was science fiction and I was wondering how long it would be before we had teleports to send us everywhere we wanted to go. What I loved about whatever the story was about, was the fact that problems would come up and the characters would resolve them. The End. It made me feel that whatever was making me feel so badly would be resolved if I could just hang in there a little longer. Whatever the new beginning is for you right now, allow yourself to be swept away by the sweet freedom that comes with it. Growth is around the corner. What if instead of viewing ourselves as being stuck, we see that we are in reality looking at a secret passageway. A door or threshold where we begin to see that we are capable of so much more than we are currently doing. The universe sends us new opportunities, new doors to enter all the time. We just need to open our eyes to see them. If we just look backward, we will miss them. The good news is that by turning around we can see what new ones just popped into our purview. Running away from a problem only increases the distance from the solution. Solving the problem is usually the best way to escape it. Sometimes to gather the courage to walk towards our destiny we need to look backwards. Not in longing, but in amazement. Amazement that after all of the broken hearts, wasted dreams, failed relationships. After all of the battle scars we wear upon our physical and spiritual bodies, we made it through. We survived and now life is asking us to thrive. So pick up courage and wear it proudly. Put a crown on your head. Walk tall. This is a new chapter in your life, and it is going to be amazing. And remember, you can still see the sunset, even on the darkest days. I don’t know where or how my story will end. What I do know is that I will never give up becoming the person I am meant to be. I will continue to grow everyday into my potential. 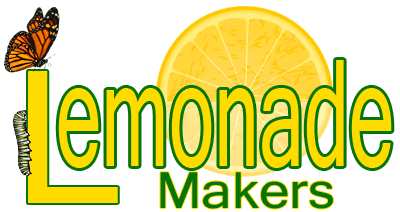 I will never give up growing and expanding what LemonadeMakers is, and what it will grow into. I am excited just thinking about the possibilities of who I can be! What will I learn next? What new doors of opportunity are just waiting for me to see them? Always remember, there’s so much more to the book than the page you are currently stuck on. We can choose to be open to the possibilities, and leave the excuses behind the fence. We can choose our attitude, choose happiness. We can choose to put the past behind us . . . , no turning back. We can choose to trust ourselves, for then you will know how to live. We can choose to take action, one step after another. We can choose to live a life of uncertainty, instead of being stuck in a rut. We can choose to say why not me? We can choose to live life, not just exist. We can choose to commit to expansive goals that grow us. We can choose to live the life we have always wanted, but never thought we deserved.